I often get a kick out of looking back at some of the first comic books I ever purchased as a 7-year-old. I obviously talk a lot about Amazing Spider-Man #296 (my first ever Spidey comic), but I’ve also referred to other series I would periodically check in on as I was first discovering the wonderful world of comic books. You would think with me being a child of the 80s and an ardent consumer of the Secret Wars series that when it came to the mutants I read about, it would be the second generation of X-Men, aka Wolverine, Nightcrawler, Storm, etc. but that wasn’t the case. Instead, that old box of comics that still exists in my parent’s basement (buried under a ton of crap and probably a few inches of dust and dirt) contains a good number of X-Factor comics from the Louise and Walter Simonson run. Yes, even as a 7-year old in 1988 I had a 60s sensibility when it came to my comics. I preferred the “original” Uncanny X-Men lineup to the “all new” version that debuted in Giant Size X-Men #1. Actually, that’s not true at all. I can state with full confidence that as a 7-year-old I had no clue that the X-Factor team was actually the original lineup from X-Men that debuted in 1963. But I do remember being enamored with the covers from the three-part “Fall of the Mutants” storyline, that marked the debut of Archangel – the evil version of one of the original X-Men, Angel, who goes rogue as part of a deal with the supervillain Apocalypse. The cover to X-Factor #25 is particularly dispiriting, as Apocalypse is holding a semi-unconscious Jean Grey by the hair as the rest of the mutant team lies on the floor in defeat. It’s probably the first time I ever purchased a comic book but was then too scared to read it because that image of Apocalypse standing triumphant was simultaneously awe-inspiring and terrifying. ASM #282 – which marks a Spider-Man/X-Factor crossover – debuted two years before my first X-Factor comic, when the team was still in its infancy. For reasons I don’t really understand, Marvel chose this ASM issue as part of its company-wide 25th anniversary celebration in 1986. While there are some “classic” storyline elements in this issue that harkens back to the Stan Lee/Steve Ditko era of Spider-Man, ASM #282 also comes across like the comic book equivalent of stuffing 10 pounds in a 5 pound bag. Namely, this comic was published at a wacky time for Marvel and Spider-Man when there was a lot going on. The issue opens with Flash Thompson’s lawyer getting slammed by the press after her client “escapes” from prison (Flash had been arrested after being framed for being the Hobgoblin – I know, I’m not going to talk about him). Additionally, Spider-Man is recovering from his knockdown, drag-out brawl with the new villain supergroup, the Sinister Syndicate and is looking pretty worse for wear. Mary Jane is around, but not really a love interest for Peter yet (and certainly not looking like a future wife after getting back from a late night date with another man). And then somehow in the midst of all this, there’s a crossover with X-Factor. I don’t know about you, but this seems like a lot of tangential ground to be covering for an anniversary issue and methinks this comic was probably just an attempt by Marvel to capitalize on a captive audience buying a “special” edition of an established series like ASM and in return getting a commercial disguised as a storyline involving a brand new team the publisher was promoting. X-Factor, had the “mutant hunting” gimmick at this point where the group was pretending to be mercenaries tracking down-on-their-luck mutants in order to offer them protection from society’s rampant bigotry. In an homage to those Ditko/Lee comics of yesteryear, J. Jonah Jameson hires X-Factor to track down Spider-Man since he’s either a “mutant” or a “menace.” Given the fact that Spidey and folks like Cyclops, Iceman and the Beast had co-existed in the Marvel Universe for more than 20 years at this point, I kinda call BS on the idea that X-Factor wouldn’t have just rejected Jonah’s offer then and there since Spider-Man is not a mutant, but I guess money talks even when it comes to mutant super-groups pretending to be mercenaries. Just to add to the head-scratchiness of this storyline, Jonah’s offer to X-Factor comes on the heels of him resigning as publisher of the Daily Bugle for his role in financing the Scorpion as an adversary for Spider-Man. Considering the writer here, Tom DeFalco, scripted that issue where Jonah resigns, you would have thought he would have avoided going to the “JJJ hires people to hunt down Spider-Man” well again so soon in comic book time. In some more coincidental news, this X-Factor crossover marks the second time Daily Bugle editor-in-chief Joe “Robbie” Robertson had a major role in a Spider-Man comic where members of the X-Men were also featured. 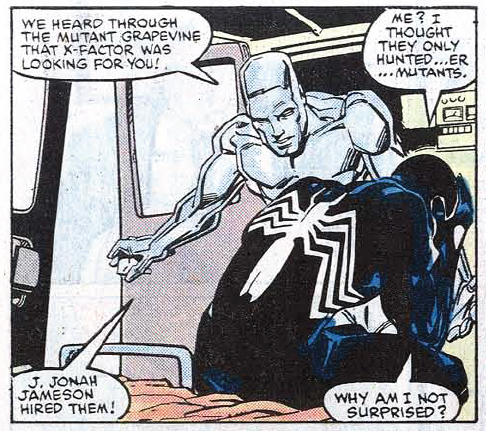 Of course, regular Chasing Amazing readers will note last week’s ASM #92 issue where Robbie is called “sambo” and then almost murdered by one of the world’s worst and most unsubtle human beings. 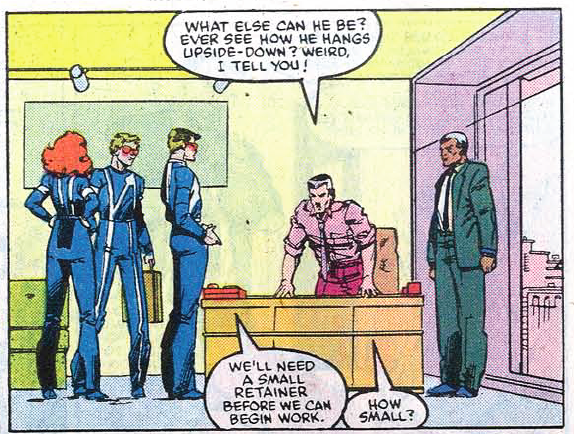 In ASM #282, Robbie has a great scene at the end when he rejects Jonah’s demands to skewer X-Factor in an editorial (for refusing to turn Spider-Man in) and offers him his washroom key as a sign of his willingness to resign. Jonah, naturally picks his professional and personal relationship with Robbie over his manic desires to bad mouth costumed heroes and villains. Reading this story so many years later, I do wonder if it would have left any impression on me as a then-five-year-old to see X-Factor in a Spider-Man comic book. Would I have gone on to pick up those “Fall of the Mutants” issues that so terrible terrified me two years later? Probably, because who knows what motivates elementary school-aged kids to do anything. 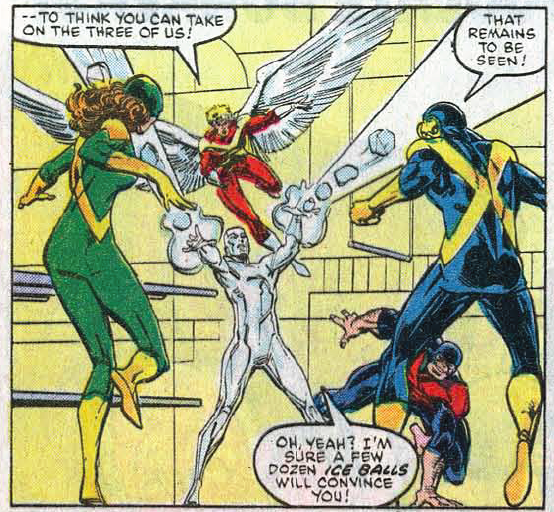 Still, I’m quite proud of my 7-year-old self for standing up to the conformists and siding with the “classic” X-Men team, rather than being taken with those other bums who only went on to make Marvel billions of dollars over the years. Great comic, if just for the fact that it was my first Spider-man that I kept. It was in a UK Marvel Annual along with an X-men, Hulk, Capitan America and a revamped cover of Avengers 221. Great intro to the Marvel Universe, and got me hooked on this version of X-Factor. Thanks for writing in! I got to tell you, I LOVE when someone leaves a comment and it turns out some random comic I touched up in a post ends up being that person’s FIRST issue of Spider-Man. 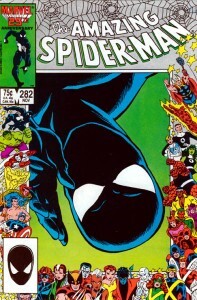 I imagine I would feel the same way if I saw some blog writing about Amazing Spider-Man #296. Black costume + the original X-Factor? I have to go find this back issue, now! I have X-Factor #1-107 plus the Fantastic Four/Avengers set up story (FF #286 & Avengers #263). I loved the X-Men team/teams of that era but the original incarnation of X-Factor was just plain awesome. The O5 had already been replaced by Havok and his team by the time I started reading comics, but my affinity for all things Archangel eventually brought me to the old Simonson/Simonson issues and I never looked back. The O5 have been my #2 all-time favorite X-lineup since. Thanks for writing the article & bringing this appearance to light, hearing about an old comic you didn’t know about is just as good as finding a new one! I was debating whether or not to cover this issue as part of my ongoing X-Men retrospective, or just give it a mention in another post, but you’ve convinced me to give it its own standalone post. This really was an odd time for an X-Factor crossover. Like you say, Marvel was likely using a high profile anniversary issue of Spider-Man to promote their new series, yet the defining element of X-Factor in this story (the whole mutant hunter ruse) was, in X-Factor itself, on the verge of being dismantled by the series’ relatively new writer. So basically, anyone who was intrigued enough by the premise of the series here to follow the characters back to their own book would have ultimately found something vastly different.